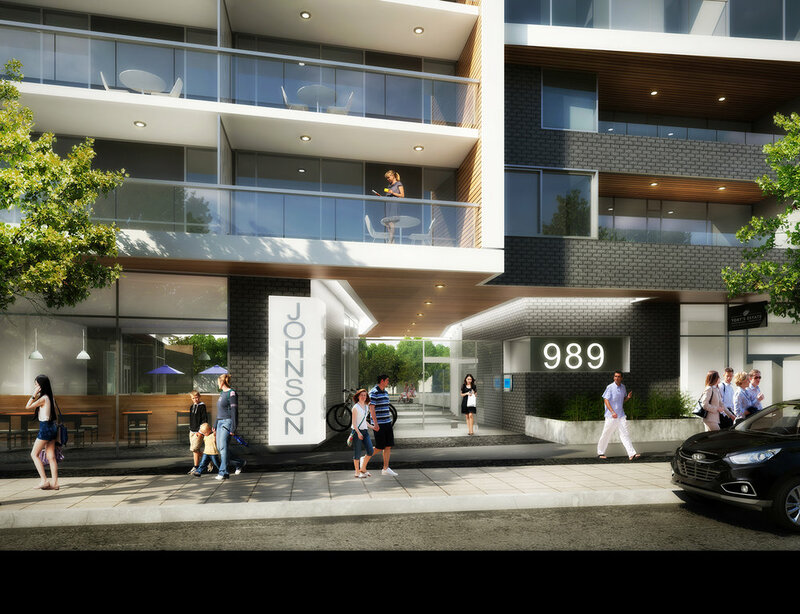 989 isn’t your typical Victoria, break the constraints of your typical daily life… Create your future. 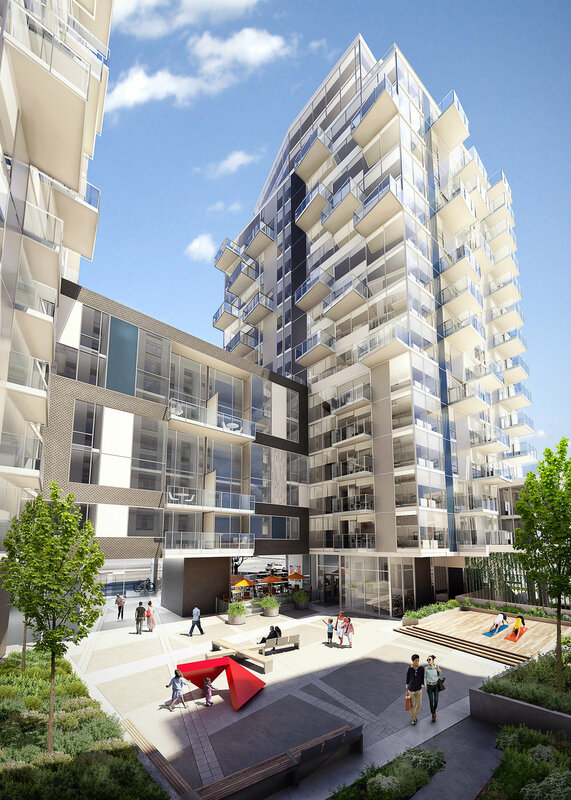 989 brings big city living to Victoria with its bold design presenting two soaring 15 and 17 storey glass towers rising from an exciting angular six storey podium. This well designed building has been shaped and sculpted to parallel how people shape and sculpt their own lives. 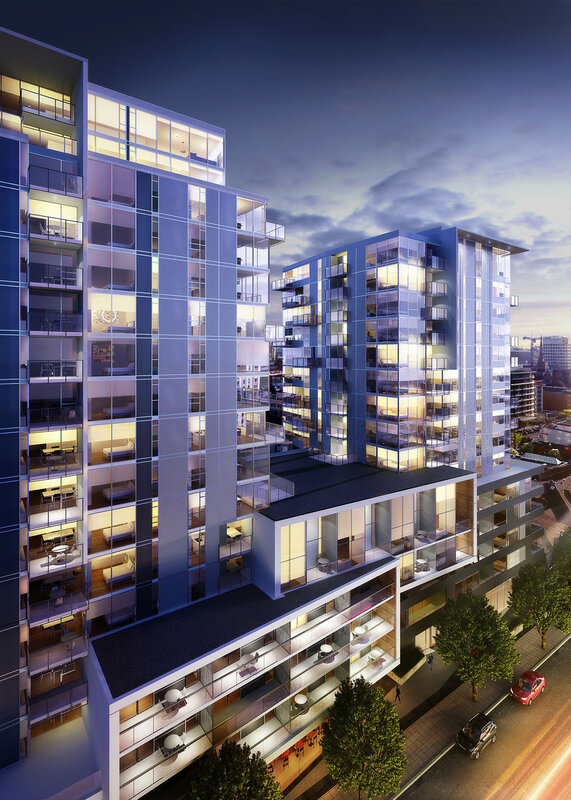 989’s 206 homes of varying shapes and sizes provides lifestyle choices for everyone. A high performance glazing system to optimize the balance of natural light and thermal comfort. Trickle vents as part of the exterior wall/glazing package in each living room and bedroom, to provide fresh air for the occupants. *Artist sculpture in Courtyard rendering by Arno Kortschot. Artistic representation only. 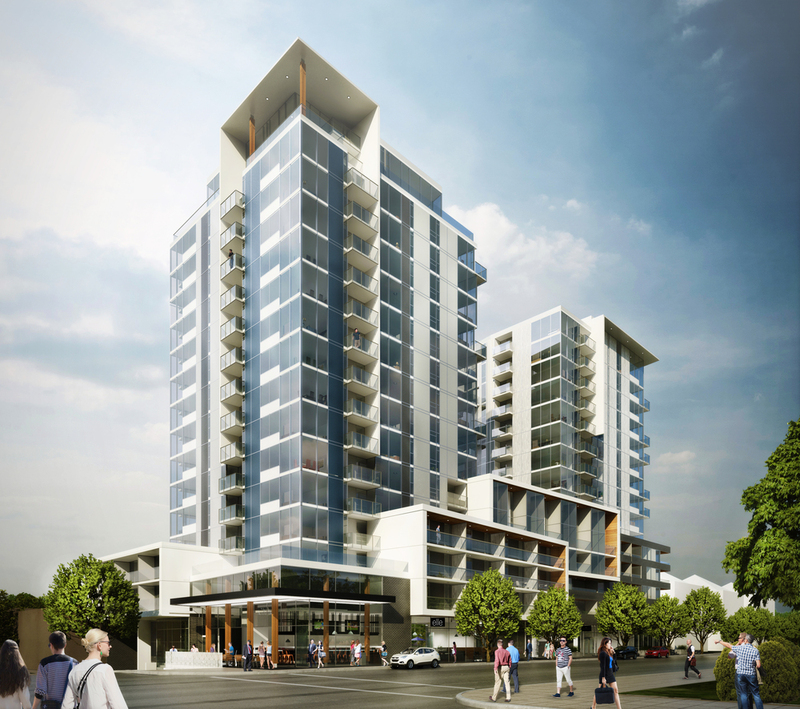 The site itself is right in the heart of downtown’s new residential urban core, with a walk score of 96. 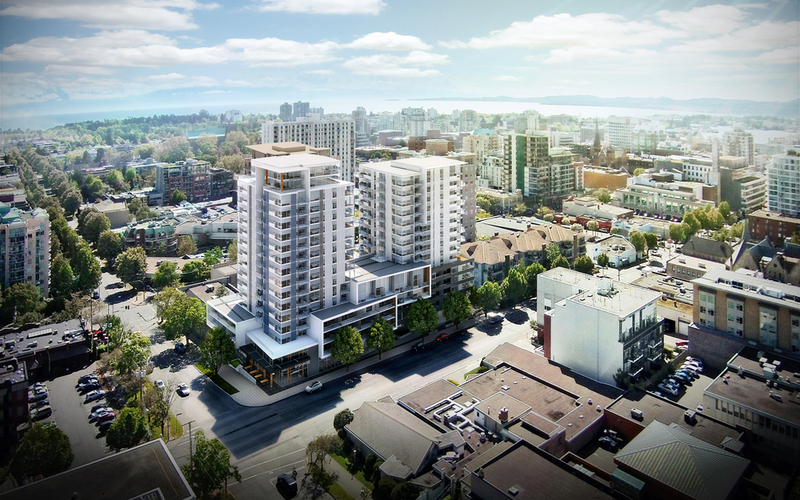 Cox Developments is a well-established BC-based firm with projects in Victoria, Vancouver and Southern California. Whether building condos or managing property, our focus has always been on providing unique, inspired homes our clients love. We work closely with exceptional architects and designers who believe in our vision: designing artful structures in vibrant urban centers within walking distance of all the important modern conveniences. We understand the advantage of living where you can work, play, shop, and dine at a moment’s notice. Quality lifestyle is a priority to us, and your home plays a significant role in that, affecting your overall happiness and wellbeing. We make sure you’re living in the home you’ve always dreamed of. All you have to do is enjoy it. Cox Developments is a father-son partnership with fifty years’ combined real estate experience. We take great care to create one-of-a-kind buildings that are not only physically beautiful—drawing on modern design elements like exposed concrete, and high-gloss cabinetry—but that also offer a solution-oriented sensibility. Our projects are always new and different, they’re tailor-made for the specific locations they inhabit. We pride ourselves on never repeating a design formula, so that each building we construct is custom-made for the community it serves. Contributing something of value to clients is our top objective, and we know that’s what you’ll find when you come for a tour. Envelope Consultant : Read Jones Christoffersen Ltd.
Geotechnical Engineer : C.N. Ryzuk & Associates Ltd.
Landscape Architect : LADR Landscape Architects Inc. Architect : HDR CEI Inc. Builder : Farmer Construction Ltd. Interior Designer : Jenny Martin Design Inc. Structural Engineer : Read Jones Christoffersen Ltd. Mechanical Engineer : AME Consulting Group Ltd.
Electrical Engineer : WSP Inc.
PRICES, DIMENSIONS, SIZES, SPECIFICATIONS, LAYOUTS, AND MATERIALS ARE APPROXIMATE ONLY AND SUBJECT TO CHANGE WITHOUT NOTICE. WINDOW SIZES, LAYOUTS, AND CONFIGURATIONS MAY VARY FROM HOME TO HOME. FOR FURTHER CLARITY, PLEASE REFER TO THE ARCHITECTURAL MODEL. THIS IS NOT AN OFFERING FOR SALE. ANY SUCH OFFERINGS MAY ONLY BE MADE WITH A DISCLOSURE STATEMENT, E & O.E.